Being Frugal and Making It Work: Celebrate the First Day of Spring with a FREE Ice Cream Cone at Dairy Queen! 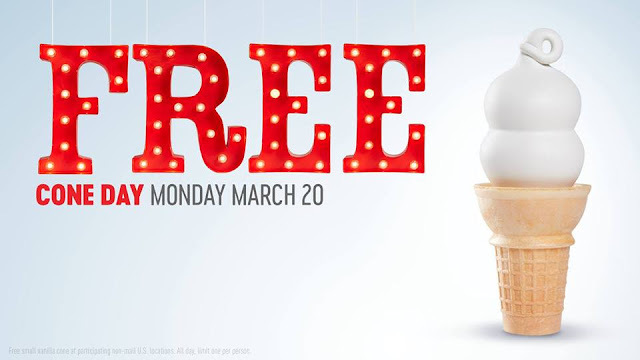 Celebrate the First Day of Spring with a FREE Ice Cream Cone at Dairy Queen! Today is the First Day of Spring and what better way to celebrate than with a FREE ICE CREAM cone?! That's right... it's #FreeConeDay at Dairy Queen! *Free small vanilla cone at participating non-mall U.S. locations. Not valid in Canada. All day, limit one per person. Store hours may vary. Oh man I missed it! We don;t have a Dairy Queen around us, so it's not a total loss! I love your blog! I recently started mine back up and am glad I found yours! It's nice to see active blogs still. So many I used to follow haven't been updated in years!